Erin Moore is a recent PA school grad beginning her career in the Emergency Department. After graduating from the University of Florida with her B.S. 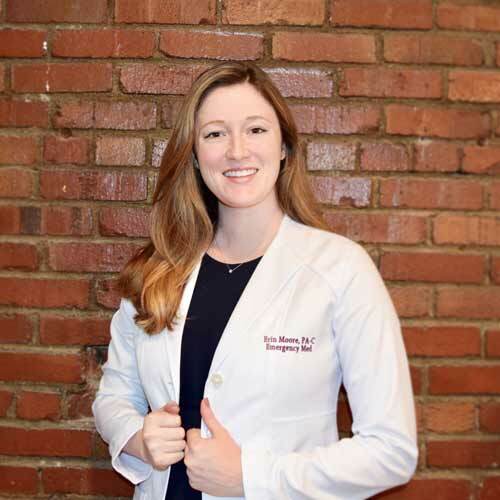 in Health Sciences, she moved to Washington, DC to begin physician assistant school at the George Washington University. There, the diversity of her patients truly taught her the importance of the impact culture has on medicine. She is passionate about bringing that awareness to other health professionals. In her spare time, Erin enjoys watching Netflix, running, and cooking. She is also the creator of the blog Stethoscope and Sparkle, which provides advice to those hoping to enter the PA profession. "Growing up, I always knew I wanted to be involved in medicine. My mother was an NP, and one of my earliest memories is her "healing" my teddy bear. I thought that medicine was magic and I couldn't wait to be old enough to do this magic myself. When I started working at UF Health, I knew that I had found my calling. Medicine gives us the ability to help others live and feel better, and it's so much more than just treating their illness. One of my favorite things about medicine is having the ability to get to know my patients on a more personal level, because not only does it make it easier for me to treat them, but it improves their mental wellbeing, something I think is often overlooked. Perhaps my biggest challenge in my journey to medicine has been my own self doubts. But the more time I spend in medicine, the more I realize that my imperfections are what make me into a good provider. I started Stethoscope and Sparkle after applying to PA school, and realizing that there were so many questions I had and not so many people to turn to. My goal is to make at least one person's journey to PA school go a little smoother. I also strive to give people a real look into what it's like to be a PA-S and to raise awareness about the PA profession." Follow Erin on Instagram and visit her website at StethoscopeAndSparkle.com.